The Humpty Dumpty lyrics were first printed in 1810 and were made famous in Lewis Caroll's book, "Alice through the Looking Glass" in 1872. In the book, the main character is shown as an egg. 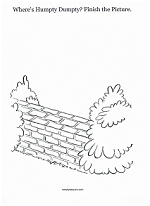 There is an interesting story about the rhyme originally referring to a cannon used at the church of St Mary-on-the-wall. In Colchester, England, a town surrounded by a wall... a cannon was placed on the wall to protect the town. When the cannon was shot during battle, the wall was damaged, causing the cannon to fall to the ground. An attempt by the people to place the cannon on another part of the wall was unsuccessful. Although interesting... When I taught the rhyme to children, I simply told them it referred to how we need to take care of things that we have. Toys, for example, cannot always be fixed once broken. I knew I had made my point when, weeks after we learned the rhyme, a little boy brought me a toy car (the kind you push backwards and then let go off so it goes forward on it's own). The car no longer worked due to excessive play, and as he handed it to me, he said "Well, that's a Humpty Dumpty!". 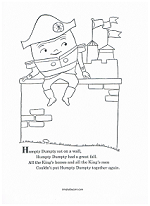 Color a page that includes the lyrics or let the kids draw their own Humpty Dumpty on the wall.